JIMMY Alapag announced on Thursday that he is retiring from the PBA for good. "It's been an amazing 13 years but turning 39 next month and having left everything that I had on the basketball court, it's time to talk away for good," the 'Mighty Mouse' said. Alapag first called in quits at the end of a memorable 2013-14 campaign that saw him lead Gilas Pilipinas to a runner-up finish in the Fiba Asia Championship in Manila as well as a historic return to the Fiba World Cup in Seville, Spain. But after taking on the role of TNT manager, the 5-8 playmaker unretired to join Meralco, becoming a vital part of the first Bolts team to reach a PBA Finals. Alapag and Co. lost to Ginebra in the Governors Cup finals in six games. Along the way, Alapag also made history by becoming the most prolific PBA three-point shooter of all time, making 1,250 treys to surpass the previous record of 1,242 of the great Allan Caidic. 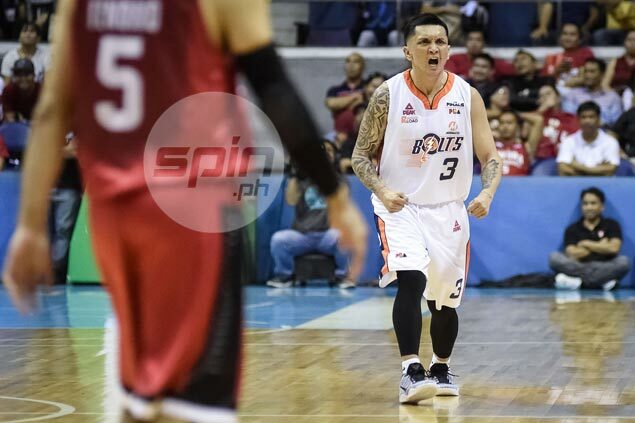 "To be part of the process (at Meralco) of building a team from our struggles in the all-Filipino and steadily improving during the season, was pretty special," said Alapag, a six-time champion with Talk 'N Text and a member of the league's 40 Greatest Players. Alapag had said that one of his biggest reasons for coming back was wanting to have his two young sons see him play for one last time. That alone made his comeback, albeit a brief one, worth it, the Bolts veteran added. "Having my four year old (son) and my two year old along for this journey meant everything ... Having my son in the locker room, having my son cheering from the stands, you can never have that time back. Alapag also hinted on what lies ahead for him at the end of his playing career. "This isn't goodbye," he said. "I'll still be seeing you guys soon and I look forward to helping the next generation of basketball players in our country."